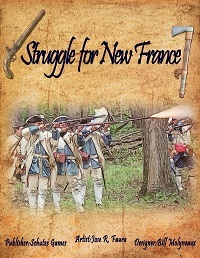 The Battle for New France is an introductory level point to point movement wargame covering the Seven Years War (1754-1762), focusing on events occurring in North America as a grand campaign game. It is designed for two players although solitaire guidelines are provided. Pierluigi Pellizzer 8 7 8 Very good gaming tool for educational purposes. As a game system, the event cards heavily influence the outcome (who receive reinforcements earlier has more chances to win), but is still an enjoyable game to play. Cheung Kar Fai 8 9 8 The game is playable and easy to learn; the graphic is good as well. Overall satisatied and recommended.